I have long given up on stuffing a huge pork loin. I have tried too many times and failed, and I get mad just thinking about it. The thing is that it looks so damn pretty in the magazines and seems like it should be easy. I have packed those loins (stop laughing) with juicy stuffing and it still came out with some areas of the pork being leathery and other areas being undercooked. The stuffing usually lived to make it onto the plate, but I’m already too upset to eat it at that point, so into the trash it goes. I am not a fan of fruit in my savory meals, but maybe those apples are the secret to pork staying moist? Or maybe my thermometer is taking a reading where the stuffing is rather than the layer of pork I should be testing. I don’t know. Either way I’m done. Every time my grocery store runs the special on the huge loin that you probably should portion and freeze, I just close my eyes and try to forget the delicious spinach and italian sausage stuffing that went to waste, or the sun dried tomato and broccoli rabe round two version that was sacrificed, and of course – the time spent on expertly butterflying the meat. So I stuff chicken now instead. Although this one takes a little time to assemble, once it is in the oven, you’re golden. Make a little rice, or boil up some pasta, and you have a complete meal and one that will satisfy anyone (who likes chicken). Plus, it isn’t like you have to prepare a stuffing ahead of time. You just find ingredients you like and roll them up! I tend to tweak the recipe depending on what is in my fridge. The basic components are chicken, cheese, and tomatoes. 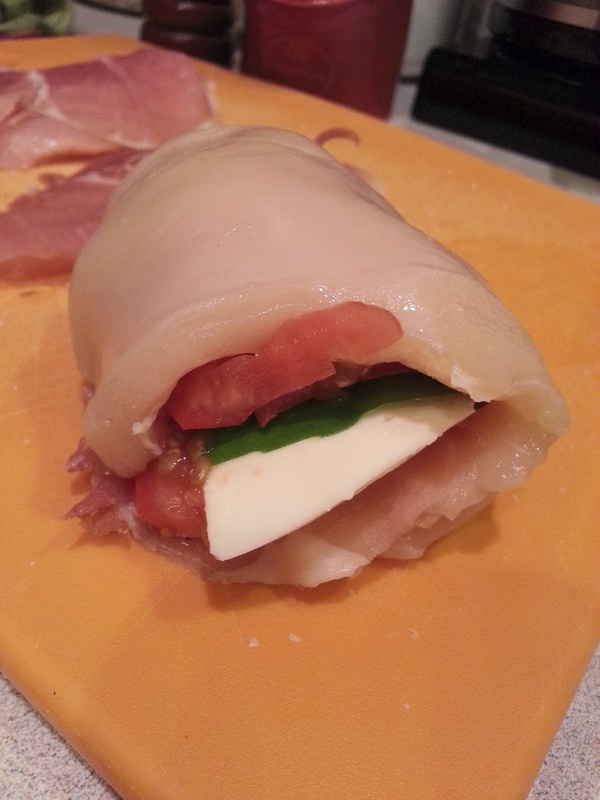 My kids like the assembly aspect of preparation – chicken, salt and pepper, prosciutto, basil, tomato and mozzarella cheese. I have done this with other combinations as well, such as ham and Fontina cheese, leftover grilled vegetables with smoked gouda or even asparagus and provolone. Everything added on top is optional. I tend to throw in extras to flavor up the juice in order to serve over rice. Make it your own and I promise it won’t disappoint. Preheat oven to 375. Arrange your ‘stuffing’ ingredients so that you can easily lay each of them on the chicken. Halve and slice the fresh mozzarella. Slice your tomatoes so that you get the amount needed to stuff your chicken (about 10-12). You want to be able to taste the tomatoes so don’t cut them too thin. Pick off the best 10 basil leaves. Get out the salt, pepper and crushed red pepper. 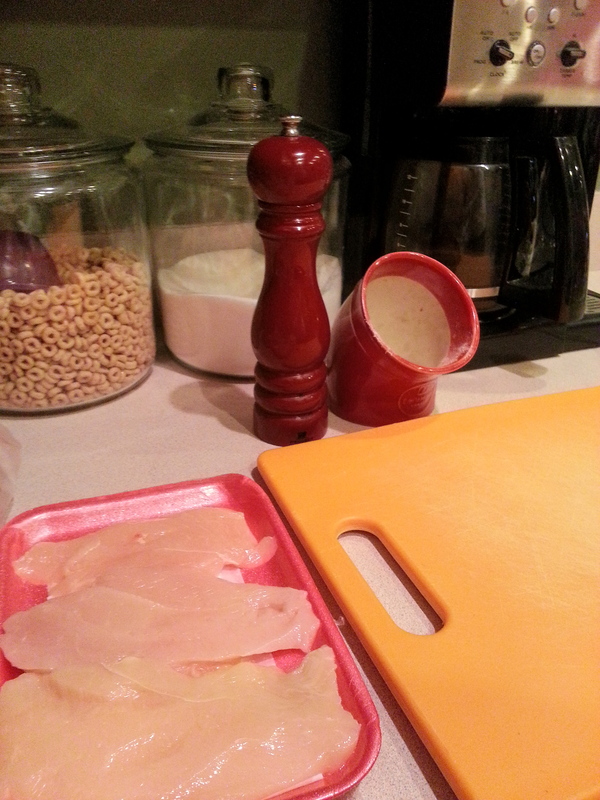 Lay out as many chicken breasts as your board allows. Sprinkle with salt, pepper and crushed red pepper. 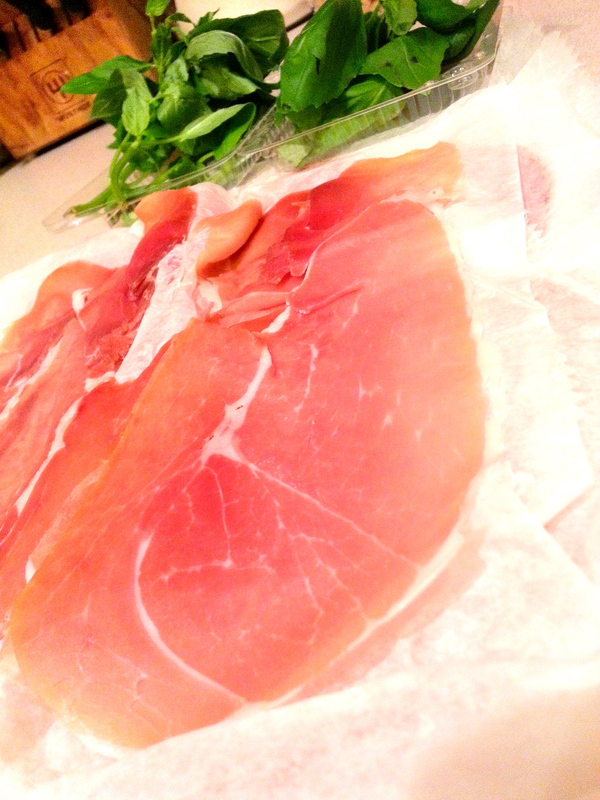 Lay a slice of prosciutto to cover the breast. 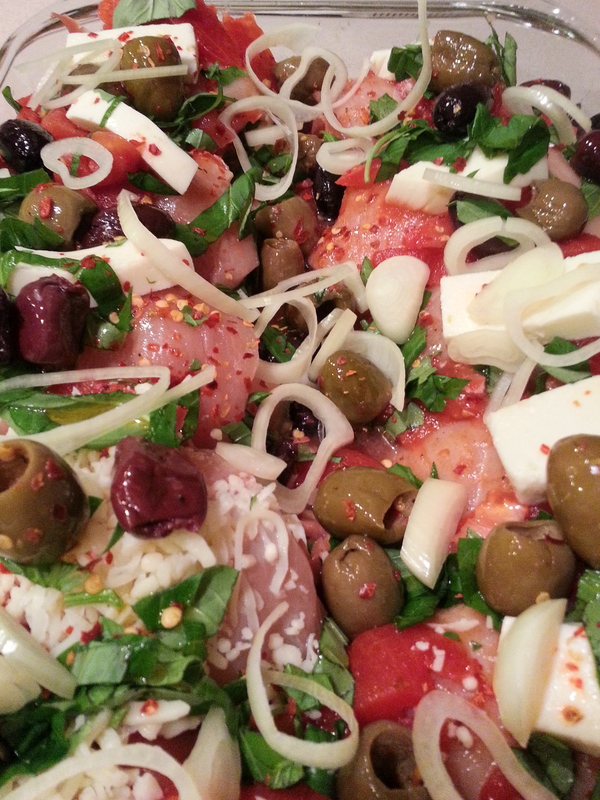 Add a basil leaf, slice of tomato and then a slice of mozzarella in the lower third of the chicken breast. 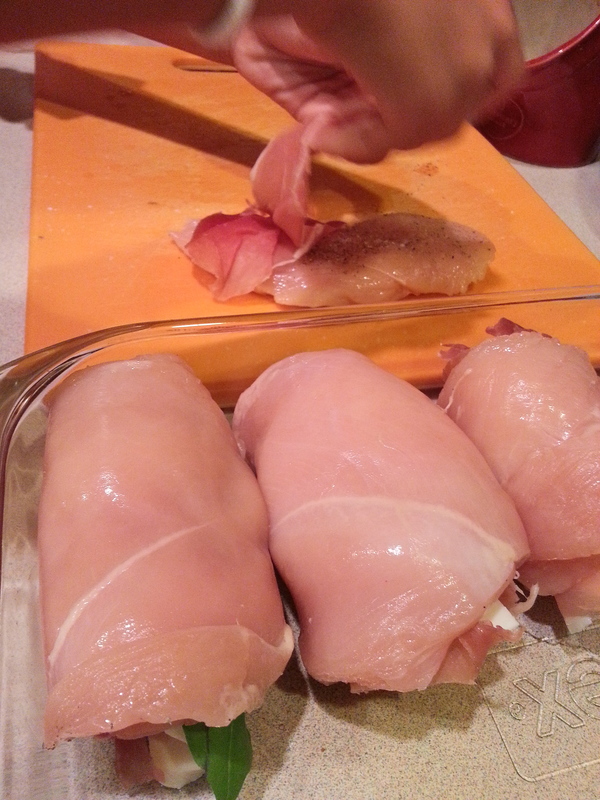 Roll up the chicken from the bottom, by placing your fingers over the stack of ingredients to keep them in place. Place the roll up with the seam side down in an oiled 11×17 glass dish. I don’t use toothpicks but if you choose to, remember to take them out! Continue rolling up remaining chicken. You should have about 10-12 roll ups. Try not to squeeze them too tightly together in the dish or they will cook unevenly. Drizzle more olive oil over the chicken and season with salt, pepper and crushed red pepper. Top each roll up with slices of mozzarella. 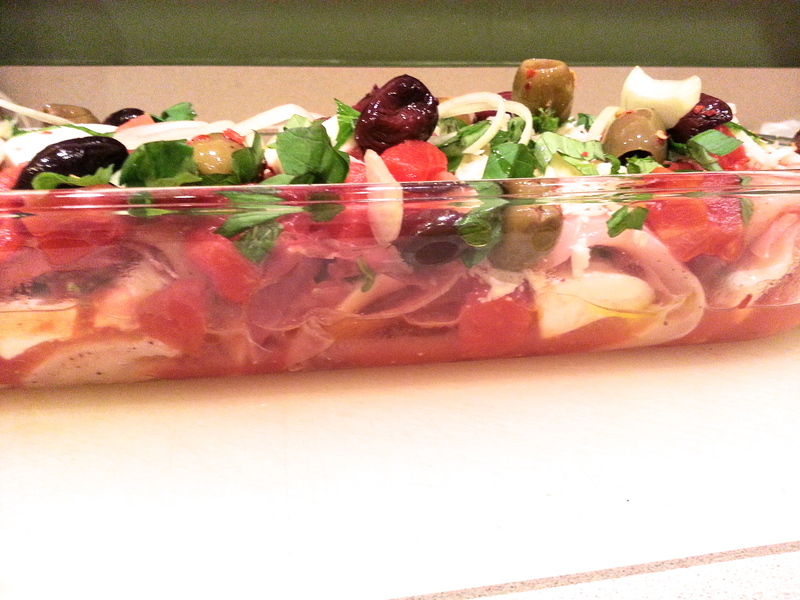 Add the canned tomatoes, sliced onions, olives and white wine. Sprinkle with chopped basil. Place dish in oven and cook for 30 minutes or until temperature of chicken reaches 155. Take dish out and let it rest for 10 minutes before serving. note: this dish serves 4 with obvious leftovers! 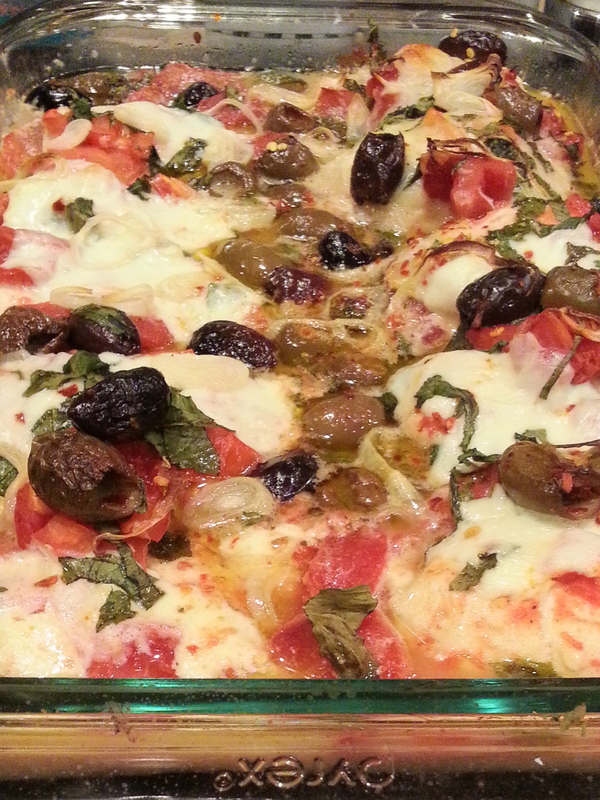 This entry was posted in chicken, main dish and tagged chicken, mozzarella, prosciutto, tomato, wine. Bookmark the permalink.